It's more than just tasting notes. The entirety of the Northeast, including New York State, was once covered by Laurentide ice sheets up to nearly two miles thick during the Late Wisconsin Glacial Period, which receded about 11,000 years ago. As the ice sheet melted it reshaped the landscape beneath it that was to take on the features that we know today, and it helped create the Hudson River Valley, leaving behind a complex and varied topography, soil, and climate–the terroir–, much of it appropriate for vine cultivation or other fruit. 1. Map from the Uncorked New York Web site. The Hudson River Region AVA is the oldest continually-productive wine region in the United States. Though most people refer to this wine region as the Hudson River Valley or the Hudson Valley, on July 6, 1982 the BATF—in its wisdom—granted the AVA but chose to call it by another name in order to avoid confusion with a winery that already bore the name, Hudson River Valley Winery (no longer in production). If one were to look at different maps that depict the region, its geographical boundaries would not entirely clear, as the maps don’t all agree. (The best one is shown above.) Unfortunately, there is no official AVA map of the region, much less a map for its varied soils and climates. However, it is clearly described verbally in print: its western boundary is the Shawangunk Ridge (a northerly extension of the Appalachians) in Orange and Ulster Counties. It then follows the Delaware River to the New Jersey State line, from which it goes roughly east to its eastern boundary at the state lines with Connecticut and Massachusetts. It then extends north along those borders to the northeast corner of Columbia County, New York. From there it extends west to the juncture of Columbia and Greene Counties in the Hudson River. It includes all or some of several counties: Columbia, Dutchess, Orange, Putnam, Rockland, Sullivan, Ulster, and Westchester. It doesn’t quite encompass all of the Hudson River Watershed, which extends even further north and includes the Mohawk River (see map at left). From this it can be seen, by comparing it to the first map, that while it is primarily geographic, most of its boundaries are political, which is not unusual for AVAs all over the country; however, it also is not strictly based on a homogenous climate or soil types—the terroir—though many of the vineyards are planted on or near the slopes on either side of the Hudson River. However, even today the true boundaries of the Valley are still in dispute, and the definition of the area of the AVA Region is questionable. Carlo DeVito, a wine writer and winery owner, commented that “The AVA is old and obsolete….it only covered the existing wineries that were around at the time of the filing, and makes no sense. More than half the valley’s wineries in the region are not covered by it. Here’s my take on it:” Where is the Hudson Valley? As can be made out from the soil map above, there is a range of soil that include “acid soils with neutral to acid frangipans” (pink color) that runs the length of the river valley, shifting to “medium to moderately coarse-textured acid soils with strongly acidic frangipans on glacial till from gray slate, sandstone, [and] slate” (red color). Contiguous to this is also “deep and shallow soils associated with hilly areas” (dark red). Along the mid to upper-length of the river we see “moderate to fine-textured soils on glacial lake or marine sediments” (pale blue). At the southern limits we see “muck” (dark blue, highly fertile) and “moderately coarse textured, very strongly acid soils from glacial till from granite” (brown color). As grapevines are not fond of acidic soils, this means that many if not most vineyards need alkaline additions such as lime to bring up the soil pH. This region crosses five [of the nine New York State] physiographic provinces and is composed of more distinct soil types than any other region. Moving north from Manhattan, the first province encountered is that of the Gneissic Highland Province, a hilly, complex region of highly metamorphosed ancient gneiss. This region encompasses the northern end of Manhattan Island and southern Rockland County, where it forms the Ramapo Mountains. The region continues across the Hudson, and the structure underlies Westchester, Putnam and a small part of southern Dutchess County. The hardness of the bedrock in this area and glacial action have resulted in shallow, rocky soils largely unsuitable for agriculture. Bordering the Gneiss Highland Province to the north is the Taconic Province, an area of lower elevation that extends from Orange County northward through southeastern Ulster County and across the Hudson River, encompassing Dutchess, Columbia, Rensselaer and Washington counties. The rocks in this province are largely shales, slates, schists and limestones, although the northern and eastern areas of Dutchess, Columbia and Rensselaer are underlain with hard metamorphic quartzite and gneiss. The topography of this province varies widely, starting as a valley in southern Orange County and progressing to rolling hills and valleys in the western portions of those counties on the east side of the Hudson, finally culminating the rugged highlands of the Berkshire Mountains in the easternmost section of the province. Given the wide variety of parent material and topography in this province, soil types and suitability to viticulture are extremely varied. Soils in the western portion of this province generally tend to have moisture problems and be low in fertility, although many good sites of limited acreage are under cultivation as orchards and vineyards. Soil conditions improve on the western side of the Hudson, with eastern Dutchess and Columbia Counties possessing the finest sites and consequently the greatest acreage of vineyards. 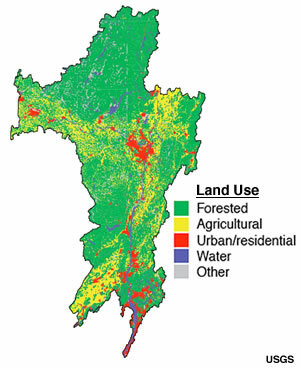 Deep, well-drained soils with adequate moisture holding capacity and low to moderate fertility are present and available in large tracts of land, and offer the opportunity for the expansion of viticulture in the Hudson Valley. Two other physiographic provinces can be included in the Hudson River Region: the Catskill Province which borders the Taconic Province along the dramatic Shawangunk Ridge; and the Mohawk Valley Province which enters the region north of Albany. Neither has significant acreage in grapes, and discussion of the soils of these areas is not relevant to this subject. The Hudson series consists of very deep, moderately well drained soils formed in clayey and silty lacustrine sediments. They are nearly level through very steep soils on convex lake plains, on rolling through hilly moraines and on dissected lower valley side slopes. Saturated hydraulic conductivity is moderately high or high in the mineral surface and subsurface layers and low through moderately high in the lower part of the subsoil and substratum. Slope ranges from 0 through 60 percent. Mean annual temperature is 49 degrees F. and mean annual precipitation is 39 inches. Hudson soils are nearly level to very steep on lake plains and lacustrine capped uplands and valley sides. Slope ranges from 0 through 60 percent. More sloping and dissected areas show evidence of slumping or mass slipping. Mean annual air temperature ranges from 46 degrees to 50 degrees F., mean annual precipitation ranges from 30 through 45 inches, and mean annual frost-free season ranges from 120 through 180 days. The elevation ranges from 50 through 800 feet above sea level. The Hudson River is one of the great waterways of North America, but it only runs 315 miles (507 km.) from its source, Lake Tear in the Clouds, located in Adirondack Park (elevation 1814 ft. (553 m.). It is what is called a ‘drowned river’ in that the waters of the Atlantic Ocean flow upstream with the tide as far as Troy, NY (north of Albany) which means that it is a very long tidal estuary–in other words, a fjord. For this reason it was known to the Lenape tribe that lived along its banks as Muhheakantuck (“river that flows two ways”). Indeed, it is the Hudson , with its moderating effect on climate, thanks to the tidal flow and winds that sweep upriver from the Atlantic as well as the so-called “lake effect” (or “river effect” in this case–except in the winter, if the river freezes and is covered with ice) of its wide, deep, flowing stream, that make it possible to grow grapes at all, as it would otherwise be too frigid for most varieties other than the native ones. Its growing season is short: 180 to 195 days. (By comparison, Long Island’s season lasts from 215 to 230 days, while the Niagara Escarpment enjoys 205 days, and the Finger Lakes AVA has 190 to 205 growing days.) Its production is also small, at 585 tons a year (about 2.5 tons an acre), whereas the Niagara Escarpment, with only 6 vineyards and 883 acres produces 4,648 tons (about 5 tons an acre), though some of this is for table grapes, which have much higher yields than do wine grapes. The AVA covers an area that extends roughly within the confines of the river valley proper, encompassing as it does 224,000 acres (90,650 ha), but it has only 430 acres planted to wine grapes among 49 bonded wineries—some with, some without, vineyards—some of which buy fruit from the Finger Lakes or Long Island to make wine from varieties that do not thrive here, and in some cases from California. Many of the wineries produce fruit wine, such as raspberry, apple, strawberry, blueberry, and so on, along with grape wine. After all, the Hudson Valley is famous for its fruit production, and once was one of the largest producers of apples in the world. However, as pointed out in an article by Carlo DeVito, “Where is the Hudson Valley?” on his blog, HudsonRiverWine, the boundaries of the AVA as currently drawn lead to confusion and are no longer relevant, given that they were drawn when there were far fewer wineries, and the number of wineries and vineyards in the Valley has not only grown exponentially, but many new ones are being established within the Valley but outside the AVA. Tradition has it that the first vinifera vines were planted by French Huguenots in 1677, at the time that they first settled New Paltz. However, this is unlikely, because these Huguenots had come from Belgium and were more inclined to drink hard cider, brandy, and brews. However, the earliest record of vinifera planting goes back to 1642, when the New Amsterdam patroon, Kiliean Van Rennselaer sent cuttings to his commisary in Fort Orange (Albany), which of course didn’t survive the winter. Settlers then resorted to American varieties, but the wines made from these were likely not pleasing at all to the French or Dutch palates, but at least it was alcoholic. The first commercially-successful vineyard was planted with Isabella and Catawba in 1827 by Robert Underhill at Croton Point, just above Tarrytown. The oldest continuously-operated winery in the nation is Brotherhood Winery, originally established as Jaques Brothers’ Winery in 1839 at Little York (now Washingtonville, in Orange County) to make wine that was mostly sold to churches. When the last of the Jaques family died in 1885, it was taken over by Jesse and Emerson, who promptly renamed it Brotherhood. The earliest-planted continuously-used vineyard, going back to 1845, was planted by William Cornell in Ulster County. His brother-in-law, Andrew Caywood became involved and began developing hybrid varieties that could better grow in the demanding climate; one of his efforts led to the Dutchess grape, still widely grown in the Northeast today. That vineyard is today part of Benmarl Winery, in Marlboro. Before Governor Hugh Carey signed the Farm Winery Act into law, there were only nineteen bonded wineries in all of New York State. Thanks to the tireless work and advocacy of people like Benmarl Winery’s Mark Miller, the new Commissioner of Agriculture, John Dyson (owner of Millbrook Vineyards and Winery), and the support of wine writers like Frank Prial of the New York Times, the restrictive post-Prohibition laws that then prevailed were replaced by a new set of laws that made it much easier for farms (i.e., vineyards) to establish new wineries for a small fee. The result was an explosion of winery growth in the State, and by 2008 there were about 255 across the State. The vineyards and wineries with vineyards in the Hudson River Region AVA (excluding cideries, meaderies, distilleries, and producers of fruit wine only), as of 2014, number thirty-one by my own count, and these are highlighted in bold type. Vine acreage is not always certain and in some cases little or no information is given The Websites are rarely of any use in this regard. A number of wineries purchase some or all of their grapes from other growers, both from within the Hudson River AVA as well as the Finger Lakes and Long Island. There are any number of perfectly good reasons for this. A winemaker may want to produce wine from a variety that he doesn’t grow. Some vineyards are too new to produce commerciable fruit. With a few exceptions, most of the wineries and/or vineyards are very small in scale–most are, after all, “farm wineries.” In no case does this reflect on the quality of any of the wines so made. The gamut of quality is there to be had. NOTE: Winery Websites will not always tell about the varieties in the vineyards, nor will they necessarily indicate what varieties go into their blended wines, as they may use generic or invented names for their blends. This doesn’t mean that one can’t ask in the tasting room. The only dependable clue as to whether the wines are made from grapes blended from more than one AVA (e.g., Finger Lakes & Hudson River) will be found on the label: if it says Hudson River Region, it may or may not be estate bottled but is from the Region; if it says New York State the wine is made from grapes from more than one region. Caveat emptor, but only if these issues matters to the buyer. As can be seen from the list, most of the wine varieties are hybrids, developed specifically for traits that would enable the vines to survive the extreme cold, humidity, and diseases. The French hybrids were often developed to produce vines based on V. vinifera that were resistant to phylloxera, as the original intention was to plant them in European vineyards. Once it was realized that grafting American rootstock to vinifera shoots would adequately protect against phylloxera, interest in hybrids dropped in Europe, but many of the hybrids have been successfully introduced to the United States. American (esp. New York hybrids) were often developed to thrive in American vineyards with their attendant cold-climate challenges and the diseases that are endemic to the region. Unfortunately, there is a serious paucity of books devoted exclusively to the entire Hudson River Region AVA. The only one still available, by Martell and Long, is out of print but can still be ordered. De Vito, Carlo. East Coast Wineries: A Complete Guide from Maine to Virginia. Rutgers U. Press: New Brunswick, NJ, 2004. An excellent guide to the wineries of the region, though having been published ten years ago, it doesn’t even include the author’s own winery: Hudson-Chatham. Figiel, Richard. Circle of Vines: The Story of New York State Wine. Excelsior Editions, Albany, NY, 2014. Written by the once-owner of a Finger Lakes winery, this is a well-written account of the story of New York wine, with a chapter devoted to the Hudson Valley and additional related material in two others. The entire book, a sweep of history going back to the Ice Ages and up to the present day, is a worthwhile read and the chapter on the Valley is especially complete and valuable. Martell, Alan R. and Alton Long. The Wines and Wineries of the Hudson River Valley. The Countryman Press: Woodstock, VT, 1993. Given that it was published 21 years ago, it is seriously out of date, and at a scarce 48 amply-illustrated pages, it covers but 20 wineries and a meadery. It is clearly meant for the general public. Berger, Dan and Tony Aspler. North American Wine Routes: A Travel Guide to Wines & Vines from Napa to Nova Scotia. Reader’s Digest Press: Pleasantville, NY, 2010. Very superficial, with no useful background and only four wineries listed on the two amply-illustrated pages about the Region. Castell, Hudson. Wines of Eastern North American: From Prohibition to the Present: From Prohibition to the Present – A History and Desk Reference. Cornell U. Press, Ithaca, NY, 2014. Its subject is rather broad so that the Hudson Valley is only touched upon here and there, but it is a fine work of scholarship and an important reference. Morton, Lucie T. Winegrowing in Eastern America: An Illustrated Guide to Viniculture East of the Rockies. Cornell U. Press: Ithaca, NY, 1985. An important book but it only offers a very cursory coverage of the Valley. Robinson, Jancis and Linda Murphy. American Wine: The Ultimate Companion to the Wines & Wineries of the US. U. California Press: Berkeley, 2013. For an ‘ultimate guide’ there are only two pages, mostly covered by illustrations and no useful map. It counts 33 wineries, mentions Millbrook Vineyards and Winery as the ‘Superstar’ and shows three wine labels. Thomas, Marguerite. Touring East Coast Wine Country: A Guide to the Finest Wineries. Berkshire House Publishers, Lee, MA, 2002. Mentions only two wineries and is out of date. Robinson, Jancis, Julia Harding, & José Vouillamoz. Wine Grapes: A Complete Guide to 1,368 Vine Varieties, Including Their Origins and Flavours. HarperCollins: New York, 2012. Simply the best and most complete reference to all varieties available in the English language. Benjamin, Vernon. The History of the Hudson River Valley from Wilderness to the Civil War. Overlook Press, New York, 2014. Using up-to-date scholarship, this is a serious and significant contribution to the literature of the Hudson Valley but, alas, there’s very little about wine. Nevertheless, a very worthwhile book to own. Be aware that most of these sites may not be up-to-date or may contain misleading or incorrect information. AppellationAmerican.com: Hudson River Region Last updated before Robibero Winery was opened, so probably prior to 2009. It lists 32 wineries in the region. DutchessWineTrail.com Website for the Dutchess County Wine Trail. HudsonBerkshireExperience.com Website for the Hudson-Berkshire Beverage Trail in Columbia County. It’s not only about wine. HudsonRiverWine.com Blog by Carlo DeVito, author of East Coast Wineries. He is the owner of the Hudson-Chatham Winery and also maintains another blog, EastCoastWineries.com, which covers wineries from Maine to Virginia. HudsonValleyWine&GrapeAssoc.com Website of the Hudson Valley Wine and Grape Association. It lists 22 wineries and vineyards as members. HudsonValleyWineCountry.org It includes links to 3 of the 4 wine trails in the region. HVNet.com: Wineries The Hudson Valley Network is more about tourism in the Hudson Valley than it is about the Hudson River Region AVA, and includes at least two wineries that do not belong in the AVA. It is also out of date. HVWineGoddess.com A light-hearted but informative romp through the Valley. It is currently maintained with fresh material, but it isn’t clear if it updates old posts. HVWineMag.com The Hudson Valley Wine Magazine is probably the source with the most up-to-date information about what is going on regarding wine in the Valley. NYSAES (Cornell U. )* The academic/scientific go-to Website for all matters agricultural and horticultural, which means viticulture as well, in the State. Also indispensable for New York State wines is the New York Cork Report by Lenn Thompson, with its many interviews, coverage of wine tastings, reviews, and more. NewYorkWines.org New York Wine & Grape Foundation, aka Uncork New York, covers all the wine regions of the state. Though it states that there are 41 wineries in the Hudson region, but that includes 3 cideries, 2 distilleries, and 1 glögg producer, so strictly speaking there are really only 35 wineries in the region. “The New York Wine Course and Reference.pdf.” can be downloaded from here. ShawangunkWineTrail.com Website for the Shawangunk Wine Trail in Ulster County. UpperHudsonValleyWineTrail.com Website for the newest wine trail in the Hudson River Region: Upper Hudson Valley Wine Trail. Wikipedia.org: Hudson River Region AVA This is only a stub, so is not useful at present. WinesNY.com: Hudson Valley Wines An unofficial wine blog with much to offer, and its coverage of the Hudson Region is interesting and informative. However, it has not been updated since 2009. *NYAES stands for New York State Agricultural Experiment Station, in Geneva, NY, which is run by Cornell University. It’s actually even more complicated than that. For a full description of the boundaries, see Electronic Code of Federal Regulations, sect. 9.47. All the figures come from Uncork New York, Regions pages. 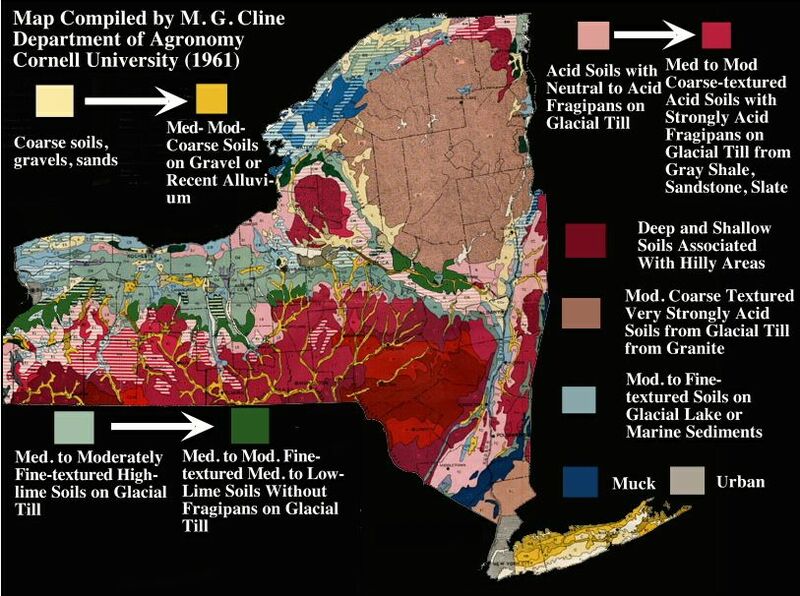 See also the excellent article on the geology and terroir of the region in WinesNY.com: Hudson Valley Wines Geology. HudsonRiver.com Wineries History; also Richard Figiel, Circle of Vines, pp. 14-28 passim. Hudson Catell, Wines of Eastern North America, p. 96. NY Wine Course, p. 77. Wine Grapes, p. 290-1. NY Wine Course, p. 75. NY Wine Course, p. 41. NY Wine Course, p. 47. This entry was posted in Miscellaneous, References, Vineyards, Viticulture and tagged Acidic Soil, Adair Vineyards, Altamont Winery, andrew caywood, Applewood Winery, Baco Noir, Baldwin Vineyards, Basha Kill Vineyards, Bashakill, Benmarl Winery, Brimstone Hill Winery, Brotherhood Winery, Cappocial Vineyards, Carlo DeVito, Chambourcin, Chelois, Clearview Vineyard, Clinton Vineyard, Cornell NYSAES Geneva New York, Demarest Hill Vineyards, drowned river, French hybrid, Glorie Farm Winery, Hudson Catell, Hudson River Region AVA, Hudson River Valley, Hudson Valley wine, Hudson-Chatham Winery, hybrid grapes, hybrid varieties, John Dyson, Lucie Morton, Magnanini Winery, Mark Miller, Millbrook Vineyards, Millbrook Winery, New York Wine & Grape Foundation, Oak Summit Vineyard, Palaia Vineyards, Robibero Winery, Royal Kedem, Seyval, Stephen Casscles, Steve Casscles, Stoutridge Vineyards, Torne Valley Vineyards, Tousey Winery, Traminette, Whitecliff Vineyard, Windham Vineyard, Windham Winery on 14 March 2014 by JoseM-L.